Holiday Celebrations Mixed Florals in Southern Pines, NC - Hollyfield Design Inc. 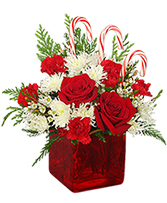 This fresh and contemporary bouquet includes Christmas red roses and carnations, snowy white LA hybrid lilies and lovely Queen Anne's lace all beautifully punctuated with Christmas greens. It comes hand-arranged in a swirled, heavy glass keepsake vase shimmering with a ruby red metallic finish and makes a thoughtful, memorable way to say, "Merry Christmas!" 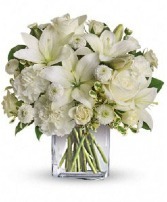 An all-white arrangement as fresh as fallen snow! 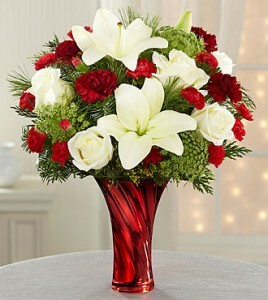 Lilies and roses set in a clear cube are sure to bring peace and joy this holiday season. Let our talented designer's design a bouquet especially for you using the freshest flowers available! Choose your own price point between $45 and $150.